Vote Pro-Life in Runoff Election! What Makes a Pro-Life Governor? I write in our main column today about what it means to be a pro-life governor. I encourage you to read it and share it with others. It is important for us to consider the sanctity of life when we vote in the Nov. 21 runoff election. Early voting starts this Saturday! We are excited to announce that we are working with Louisiana College to host the first-ever Louisiana Life March Central on Saturday, Jan. 30 in Alexandria and Pineville! We are looking forward to this great event, which will be the first of its kind in Central Louisiana. Please mark your calendar for this and our other two Louisiana Life March events in Baton Rouge and Shreveport, both scheduled for Saturday, Jan. 23. If you are looking for more consistent pro-life news, please consider following us closely on Facebook and Twitter, or subscribe to the National Right to Life News Today. Please also take a look at the October 2015 National Right to Life News! Louisiana Life March North, South, and Central Set for January 2016! Despite the judge's claim for Louisiana and others' claims for the nation, there are many women's health care options available without Planned Parenthood. U.S. District Court Judge John deGravelle has ordered the state to continue using taxpayer dollars to fund Planned Parenthood. deGravelle issued on injunction last Thursday, extending a temporary order he issued more than a week ago that protected funding for 14 days. Planned Parenthood sought an injunction after the state Department of Health and Hospitals terminated its Medicare contract in September. The state said it was cancelling the Medicaid contract for cause, a Medicaid fraud allegation in Texas two years ago by Planned Parenthood Gulf Coast, the same company that operates two facilities in Louisiana. Even though hundreds of other health care options exist for the small number of women who get non-abortion care at Planned Parenthood, deGravelle claimed the opposite as true. Gov. Bobby Jindal has vowed to challenge the judge's order in a federal appeals court. "We will appeal the decision to the 5th Circuit, and we are confident that the court will reverse this ruling," his office said in a statement. Grant Parish PULSE Youth Rally Has Been Postponed! A pro-life immersion night for youth in seventh grade through college was originally scheduled for Saturday, Nov. 7 at First Baptist Church of Pollock, but the event has been postponed. A new date will be announced as soon as it is available. PULSE youth rallies feature music, food, fellowship and more, and students can learn about getting involved in pro-life efforts in their schools and communities. For more information on scheduling a youth rally, contact Alex Seghers at 866.463.5433 or alex@prolifelouisiana.org. Join us and our friends at Creation Festivals for a concert by Christian (and pro-life) artist Matt Maher! We have received a lot of questions and inquiries about the two candidates in a heated runoff for Louisiana governor. Pro-life citizens clearly understand that the role of governor is essential to the protection of human life. The questions have generally focused around whether the candidates are pro-life or not. To find how Representative Edwards and Senator Vitter have answered the Louisiana Right to Life questionnaire, and to learn about their voting records on life issues, please visit our website www.ProLifeLouisiana.org/Governor2015. We also encourage you to research, on your own, the statements of candidates and their history of interaction with the pro-life cause. While understanding where candidates stand is of upmost importance, we also encourage you to ask another question: What makes a pro-life governor? Answering this question can provide you a roadmap as you consider how to vote pro-life in any election for governor. 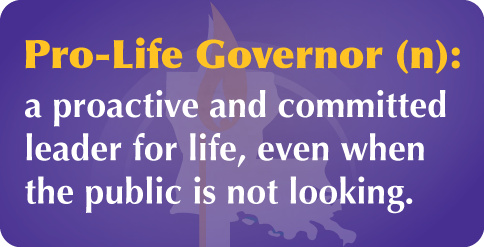 I summarize the qualities we need in a pro-life governor in one phrase: proactive and committed leadership for life, even when the public is not looking. The role of governor in Louisiana is a powerful one. It spans from interaction with the Legislature, the enforcement of laws within a vast administration, the defense of laws in the court system, and the ability to place critical issues on the forefront of the Louisiana citizenry through the "soapbox" of the Governor's Mansion. Each of these areas of gubernatorial responsibility is key to protecting life. But it takes a governor who is truly committed and proactive to the pro-life cause to fulfill the role of a pro-life governor because so many decisions occur out of the public eye. Let's take a look at four key areas of a governor's responsibility as it relates to the pro-life cause. At the core of the governor's pro-life responsibilities is to sign pro-life legislation, and when necessary, veto anti-life legislation. It is easy for us to evaluate our governor's success or failure because of the public nature of these decisions. Recent history shows us that all our governors have been pro-life in this regard. But before legislation is even discussed, a governor should be concerned about whether the leadership of the House and the Senate shares a pro-life commitment. From them, will the makeup of key legislative committees reflect the pro-life will of the people? This is important, as it will likely determine whether pro-life legislation succeeds or fails. Once the session begins, the governor can call attention to key legislation he supports. On the flip side, the governor can help address issues with concerning legislation or seek to defeat anti-life legislation outright. And what about the "gray" areas? Will our governor side step the challenging issues or meet them head on? There is no way for the public to "score" those times a governor turns a blind eye to a tough issue. What will our governor decide when we are not in the room? If you thought certain legislative decisions were tough to evaluate publicly, that pales in comparison to the decisions, or lack thereof, within a governor's administration. To begin, the governor cannot be everywhere and often cannot be reached. Will his staff be committed to the pro-life cause or at least willing to proactively implement the will of the governor? Proactive is the key word here. Important decisions can be "lost" in communication. As the state's chief executive, the governor's responsibilities include the enforcement of laws, and the governor does that through many different departments and agencies. Each department has a leader the governor must appoint. Will these critical heads of such departments as the Department of Health & Hospitals and the Department of Children & Family Services be pro-life? Will they administer with the commitment of the governor? Louisiana has perhaps the most pro-life set of laws in the nation. But if these laws are not diligently enforced, they are not worth the paper they are printed on. With an abortion industry looking to cut corners and maximize profit, will the administration protect the health and safety of women by ensuring abortion facility regulations are enforced? Once pro-life legislation has been signed, pro-abortion attorneys will likely challenge it in federal court. We are experiencing this right now as the Unsafe Abortion Protection Act, signed into law in 2014, languishes in federal district court awaiting a decision on its future. Is our next governor prepared to put the resources of the administration on the hook to defend these laws? Many important decisions will be made by the next governor on the defense of life in courtrooms, especially as it relates to defunding Planned Parenthood. Will our next governor be a proactive pro-life leader? It is essential to have a governor who places the life issues on the forefront and is committed to finding new ways to protect human lives in Louisiana. The governor can promote positive education and awareness on crucial issues, such as adoption, abortion, pregnancy resources centers, and much more. The governor can accomplish this by using the power of his office to deliver a pro-life message in ways that average citizens cannot. Whether at his own events, directly to the media, or at existing pro-life functions, the governor can magnify the pro-life voice in hopes of altering the fabric of culture toward life. In conclusion, becoming a pro-life governor takes a person willing to be a proactive and committed leader for life, even when the public is not looking. It takes initiative. It takes commitment. It takes pro-life leadership. As citizens of a pro-life state, we should settle for nothing less. Students from St. John Catholic School in Plaquemine prayed at the Baton Rouge vigil site. It was the largest school group to participate at one time during the campaign's five-year history. 40 Days for Life campaigns in Louisiana and around the world ended Sunday after 40 days of prayers being heard and lives being saved. The 2015 campaign began Sept. 23, and in Louisiana prayer warriors kept vigil outside abortion clinics in New Orleans, Baton Rouge and Shreveport. In all, 26 unborn babies were reported saved during the Louisiana campaigns. The New Orleans 40 Days for Life campaign reported eight saves as several hundred men, women, teenagers and children stood together to protect women and unborn children from abortion through inter-denominational prayer, peaceful vigils and community activism. Campaign coordinator Shanon Snyder said 56 churches participated this fall in the NOLA campaign. The campaign held its closing vigil Sunday at St. Anthony of Padua. The event was originally scheduled for the Planned Parenthood construction site on S. Claiborne Avenue, but the location was changed Friday because of the treat of heavy rains over the weekend. Spirits at Shreveport-Bossier's closing candlelight vigil were not dampened by rain Sunday evening. The SHREVEPORT-BOSSIER campaign ended with a candlelight vigil Sunday night. Though it was raining, spirits at the event were not dampened. Campaign director Chris Davis reports five saves during the Shreveport-Bossier fall campaign. He said this year's campaign participants included 25 new sidewalk counselors, 75 new prayer volunteers, wonderful testimony from former Planned Parenthood abortion referral center manager Ramona Trevino, and the birth of baby Noah, whose parents said yes to life during last spring's 40 Days for Life campaign. In BATON ROUGE , 13 unborn babies were confirmed saved. Members of a broad diversity of churches as well as high schools and youth groups participated in the campaign by praying at the vigil site. National 40 DFL board member Matt Britton, left, and co-founder of 40 DFL David Bereit are shown with Baton Rouge co-chairs Charlotte Bergeron and Danielle Van Haute. David Bereit, co-founder of 40 Days for Life, made a brief stop on the evening of Day 36. He thanked all those present and encouraged everyone to persevere in their stand for the unborn. "We were also blessed to have several high schools and youth groups come out to pray," said campaign co-chair Charlotte Bergeron. "St. John Catholic High School in Plaquemine brought their sophomore and senior classes one morning - the largest group of students to come in our five years. More than 80 students and faculty heard a presentation by Clelie Carpenter, a 40 Days for Life BR outreach coordinator and sidewalk counselor." Catholic High School students also met Carpenter, who was present with her church, Bethany, which adopted two days. Clelie invited an abortion-minded mom who she had counseled last year in front of the Delta abortion facility, and the students were delighted to meet Baby Moriah, who was saved from abortion.